It is estimated that over 80% of bacterial infections are associated with biofilm formation. Biofilms are organized bacterial communities formed on abiotic surfaces, such as implanted or inserted medical devices, or on biological surfaces, such as epithelial linings and mucosal surfaces. Biofilm growth is advantageous for the bacterial organism as it protects the bacteria from antimicrobial host factors and allows the bacteria to reside in the host without causing excessive inflammation. 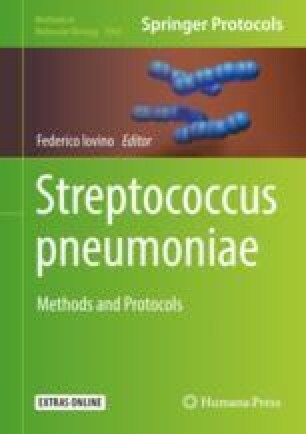 Like many other opportunistic pathogens of the respiratory tract, Streptococcus pneumoniae forms biofilms during asymptomatic carriage, which promotes, among other things, persistence in the niche, intraspecies and interspecies communication, and spread of bacterial DNA. Changes within the colonizing environment resulting from host assaults, such as virus infection, can induce biofilm dispersion where bacteria leave the biofilm and disseminate to other sites with ensuing infection. In this chapter, we present methodology to form complex biofilms in the nasopharynx of mice and to evaluate the biofilm structure and function in this environment. Furthermore, we present methods that recapitulate this biofilm phenotype in vitro by incorporating crucial factors associated with the host environment and describe how these models can be used to study biofilm function, transformation, and dispersion.